Are you aware of this??? I don't know if Karl is, but I have seen the web page for the ordinary/first version before. It's just a transistor emitter follower amplifier, simular to the composite video circuit often used with Zeddies in the past. I have 2 USA versions of the ZX80 here, one from myself and another one from a customer. I am trying to use the ZX8-CCP module on it, but get no output at all. Is this module compatible with the USA version of the ZX80? Now that is a question that I don't know the answer to. The basic version (ZX8-CCP) without fast mode sync definitely works on a U.K. / European ZX80. As I have fitted one inside the modulator for RWAP on the ZX80 he had. 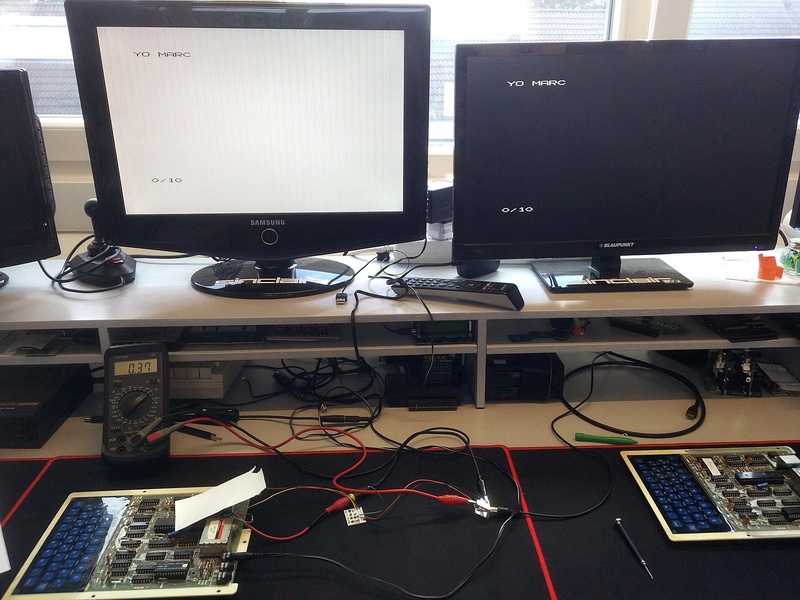 As the video signal from a ZX80 is a monochrome composite signal, I can't think of any technical reason why a ZX8-CCP would not work in a USA version. Ok, just tried a ZX80 EU version, get no output as well. So I connect 5V (legs of 7805 for testing) and the yellow wire to the input of the modulator. I solder an RCA female plug to the ZX8-CCB output, connect it to an LCD TV and measure the voltage as well: 0.0V, no picture, whatever variable resistor I twist (very slowly). While measuring I found some strange things. Video input voltage level (average by multimeter) is about 0.9V, so ok I guess. This signal is fed through R1 into IC3, an AND gate. But this AND gate does not output any signal on pin 4. Yes, there is a voltage input on IC3, about 3.7V, the output of D1 which loweres the 5V to the supply level needed by IC3. So what's going on with IC3 (and IC2 doesn't output anything as well)? I have 3 ZX8-CCB boards ordered at the same time a couple of years ago. Could it be the AND gates are not working and need to be replaced? Ok, more studying brought me to the conclusion the supply voltage created by D1 (which outputs about 3.7V) is too high for the LVC1G08 to switch with the video input of the ZX80. I've replaced D1 by some 1N4001's to get to a supply voltage as low as 2.5V, which finally gave me some output. Most probably the voltage level of the composite video signal of the ZX81 is higher than the one from ZX80. Alright. Well. So far for ZX8-CCB -alone-. That boosts voltage levels and inverts picture. The ZX80 composite video signal is not enough to feed the ZX8-CCB directly - most of the time I guess (since some of you did succeed with the ZX8-CCB alone I guess?). Adding this small transistor circuit will make it work just fine. I have this board fitted to my ZX80 and works just fine for me and I'm not aware of it not working for anybody else.